The holidays are such a wonderful time to celebrate the past year with friends and family and we at coldLogic certainly have something to celebrate! Recently the annual Avi Choice Awards took place and once again we were blown away by the love the Second Life community has shown us. Thanks to your efforts coldLogic has received its third AviChoiceAwards trophy, this time for “Favorite Mesh Designer”. So go ahead, spread some holiday cheer with all the sparkle and shine that you carry with you year round and thank you for your support! 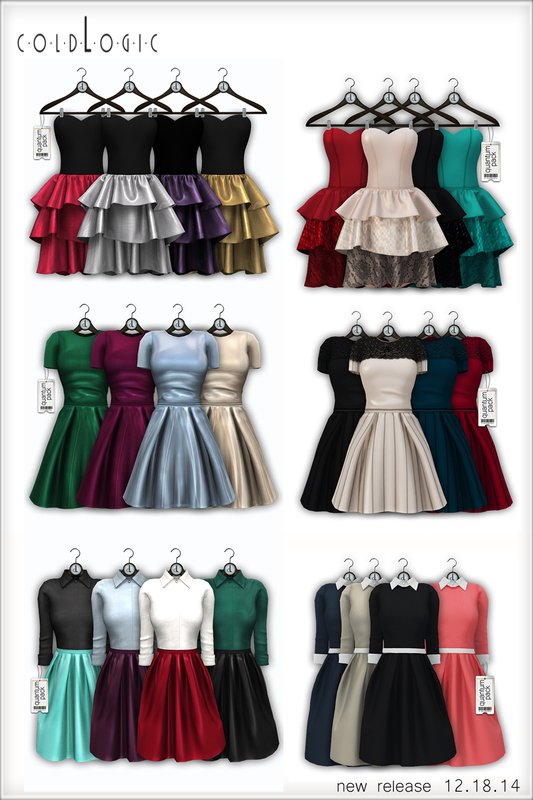 The festive dresses shown above are all available now at the main store and on the marketplace! The coldLogic team wishes you the very best of holidays. – Damien Fate, Janie Marlowe, Zyrra Falcone. Happy Wednesday! This last week has been full of travel for Thanksgiving. Going home for the holidays and enjoying family time is no excuse for lounging around in sweatpants and baggy tees, do it in style with today’s coldLogic release of four festive outfits. Enjoy!